Zambia has the potential to be transformed into a digital economy. According to Brian Mushimba, Minister of Transport and Communications of Zambia, the transformation is being driven by the on-going Phase II of the country-wide construction of communications towers. "Our major wish as a country is to move from 4G to 5G networks, taking a leaf [out of the book of] countries like China, whose GDP contribution is largely supplemented by the communications sector. The Zambian Government is also convinced that the improvement of the information and communications technology (ICT) sector is the only sure way for Zambia's economic development," said Mushimba. Although there are still some parts of the country grappling with poor mobile communications services and operating on 3G networks, Mushimba said the government is determined to work with mobile communications service providers to ensure that they upgrade mobile communications services fully to 4G and eventually switch to 5G networks in the near future. 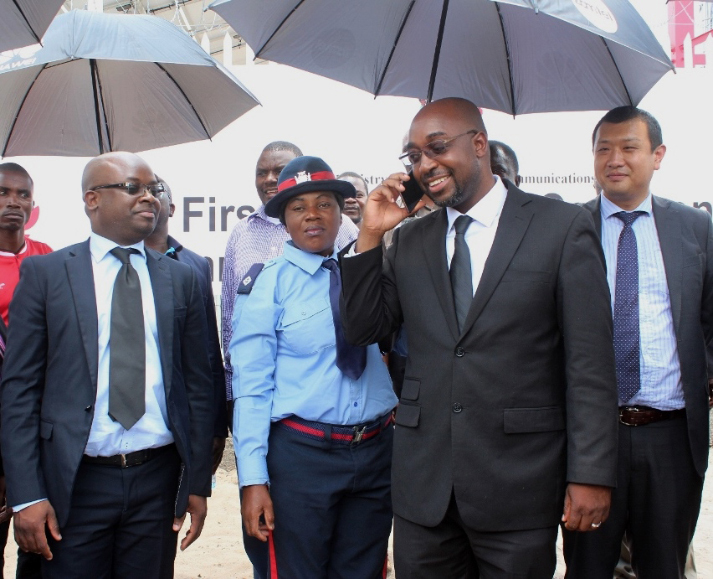 Mushimba highlighted that the state-of-the-art communications infrastructure the government is constructing with the help of Huawei, a leading global provider of ICT infrastructure and smart devices based in China, is designed to increase the radius of coverage from 5 to 10 km. It will also enhance the quality of Internet and mobile services because of the advanced radio links that are being installed in all of the country's 10 provinces. The first phase of the project focused on the expansion of mobile communications services to underserved and unserved parts of the country. However, Mushimba said this did not yield the expected results, hence the government's decision to enter into a new financing agreement with the Export-Import Bank of China to support the second phase of new focus clusters at a cost of $280 million. The clusters have the potential to change the economic outlook of the country, said Mushimba, owing to the fact that they are characterized by a lot of socio-economic activities like road networks, clinics, markets and schools. He said these clusters also make it easy for small and medium-sized enterprises to set up mobile money kiosks and offer such services to people living in those areas. Instead of walking long distances to access financial institutions for single cash transactions, people living in the clusters simply walk to booths dealing in money transactions to get their cash via mobile phones, Mushimba explained. "I run a small kiosk here, where I sell airtime vouchers. Through this business, I am able to support myself," said 21-year-old Namasiku Ilukena, a mobile money dealer in Nalolo District of Western Province, who has been operating his business for close to two years. In its quest to promote an efficient and less bureaucratic governance system in all government departments and quasi-government institutions, Mushimba said the government is promoting e-governance in the agricultural sector where small-scale farmers in all 105 districts in the country are able to receive fertilizer, farming equipment and chemicals through the e-voucher system. According to Mushimba, the e-voucher system will help close the loopholes that allow for corruption in fertilizer, farming equipment and chemicals distribution programs. The construction of communications towers has not only enhanced people's access to mobile services, but has also benefited the country and citizens in many ways and has drastically increased government revenue collection though mobile money transfers. "We are slowly moving into a digital economy where everything will be done electronically. And the government wants to strengthen the e-commerce and e-governance systems. These have a number of benefits such as reduced queues in banks, shopping malls and government offices," said Mushimba. He indicated that the long hours that people spend accessing a service or a product will be reduced once all the 1,009 communications towers are installed in all districts and provinces across the country. "As the government improves Internet services through the installation of the optic fiber network, more and more people will open up online purchasing platforms, establish courier companies and create employment for the youth and women in the long term," he said. In the areas where the communications towers have been installed, communities are able to access information on commodity prices via SMS and by logging into various government websites. "During the maize marketing, when the government announces the floor price, you will find that a good number of farmers will access the information via mobile phones. And that is what the government is encouraging through this project," said Mushimba. Through this project, the government is encouraging the use of ICT facilities such as computers in schools so that learners can access educational materials via the Internet and improve the quality of learning. Most people in rural areas had not heard or seen a mobile phone until the government, via Huawei, constructed communications towers in their vicinities during the Phase I project and the beneficiary communities include 118 chiefdoms. "We have two towers in my chiefdom. We thank the government for the gesture but we also need taller ones. We hear they are better and cover a wider area," said Chief Lumpuma, from the Copperbelt Province. The days of needing to find high ground to get a network signal is now long gone, said Chief Mpande of Mbala District, Northern Province. "On many occasions, my people would climb anthills and tall trees just to make a call. But now after the government constructed communications towers, we don't experience that anymore," he said. Mushimba believes that the continued engagement of Chinese companies such as Huawei will help transform the country's communications landscape, provide a conducive environment for trade within regional blocs, such as the Great Lakes and the Southern African Development Community, and beyond. "Huawei has been an all-weather partner in the development of the communications sector in Zambia. Our close ties with China will undoubtedly go a long way in rejuvenating our young and blossoming economy," said Mushimba.